He was a pioneer member of Ipoh Branch of our Church and was in our very first meeting there, as in the above photo, before a branch was established. 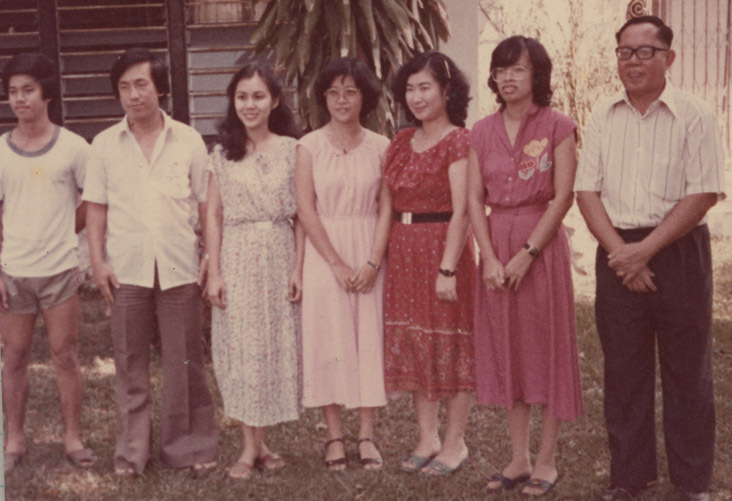 Every missionary who has ever served in Ipoh would know of the Toh family because he participated in this historic event recorded here and influenced many others to join. It has never been easy to get the whole family together to Ipoh and when we could it was always a delight to visit the Toh family. In the above photo taken in Feb 2008 we managed to have the 4 boys visit their home in our Chinese New Year trip. 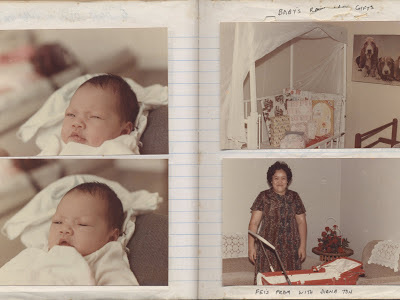 In the visit, the boys got to visit with their Auntie Diana again, seen on the top left, who had come to KL to care for their Mom and each one of them when they were a baby during their first month of life. This is a practice of the Chinese tradition of birth. Indeed their Auntie Diana came to help us as early as June 1984 to care for Fei, our very first baby, as in the above photo. 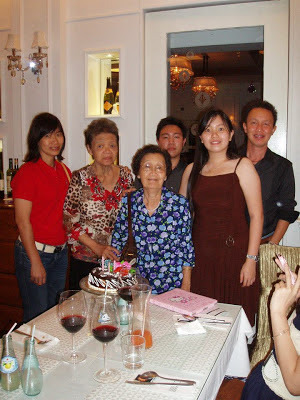 The family has since then elevated the position of Auntie Diana to become Lady Diana of Ipoh as recorded here. A spiritual note to share in my remembrance of how it all began reminds me of the miracle of God's plan when I first got to meet Diana as a missionary when she was referred by her sister Stella in the UK who was a member of our Church. This real miracle that our missionaries are guided by the Spirit to find souls ready to be taught is recorded in my missionary journal. From Diana, we were led to her father and family. I must firmly say 'Papa Toh' was a good example of one truly converted by the Holy Spirit and the Book of Mormon as he read the whole book very fervently and knew it was from God. From his baptism, many others followed who were either from his family or those outside whom he had helped to fellowship, even producing another missionary for the Church through his daughter Annie who lives in Utah today. I can imagine all the fruits that will still be forthcoming from his posterity that will fill the earth in time to come. A few years after my mission, I happened to be in a KL city courts office and by chance talked to a man from Ipoh who knew Toh Chin Guan and his conversion to the Church that he excitedly talked about. I was so impressed that from his simple baptism in the Church in Ipoh, this news could spread out to a stranger in KL that I had met by chance! I and my family have been even blessed by our continued association with Papa Toh and his family over the years as I had returned to the country and raise my own family in the nearby city of Kuala Lumpur. In my involvement with leadership work in the Church District that once covered the whole of the peninsular, I had the chance to be in Ipoh many times and from my pictorial journal, you can see the face of Elder Toh Chin Guan there. He is one of the many good men and women involved in the service of their fellowmen as we can remember it and all in heaven too I'm sure. He has lived long enough at 93 to deserve a good rest with his loved ones who have gone ahead earlier. Others have to wait longer like Ralph T. Cannon from Salt Lake City who knows him well when he served as District President(1981-82), who is still living at 96 years of age today! As we mourn over his passing, we should celebrate his life of Joy is what I feel today. I remember many of his quotations and jokes he has shared with me when I was a young missionary in his home. It was always a delight to visit with him. I was impressed when we last visited him as in the first pic above, the family asked him who I was to test his failing memory and he could say my full name out loud! Always joyful and humble in his ways is how I will remember him forever and ever. Just past 2 years later on 30th December 2014, I received news that Mama Toh passed away! 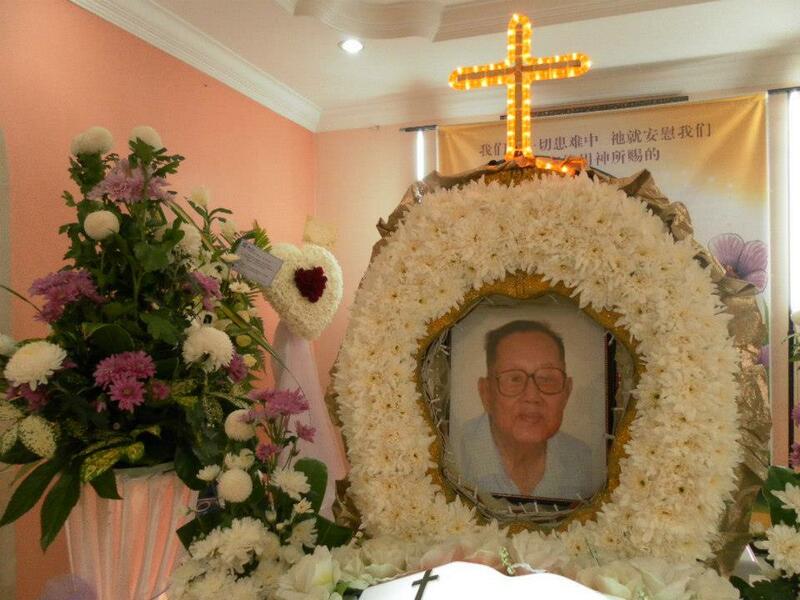 I happened to be still in KL and could attend the funeral in Ipoh on a Friday 2nd Jan 2015. All family members were present, even Annie her returned missionary daughter, via the internet as she had just recently traveled earlier a long distance from the US when her mom was in hospital. Stella at the front, has always been the stalwart oldest child who cared for the family even though she lived most of her life in the UK as a nurse. Always good to see missionaries even on sad occasions like this especially the few I know who have served for some time in our Clementi Ward in Singapore, namely Elder Lallemant and Sister Carson. Her allotted chamber for the cremation had to be no 7 which will make this blogpost photo definitely part of my Story of 7. 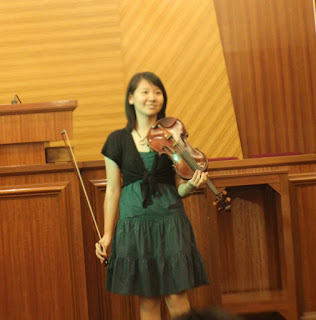 ... in a special place by her beloved husband, our Papa Toh. I hope to return one day here again to capture both of their plaques together as a memory that will forever be embedded not just in my journals but in my mind of all the happy memories of my life and friendship with the Toh family. The photo below from one of our stop-over visits in Ipoh inspires me to write the closing for this post. 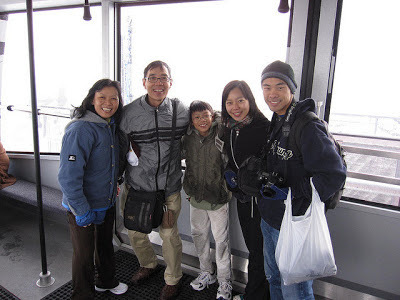 I like to now share my thoughts in writing this blog post that actually was first written after the post of the passing of the Mom of our family on 6 Nov 2012 when Papa Toh passed away two weeks later on 30 Nov 2012. Now I've included Mama Toh who most recently departed on 30 Dec 2014. I can imagine the joy of all three of them rejoicing to meet together again in another world separate from ours though not completely as I've always believed, feeling that there is only a thin veil keeping us apart. I can feel the joy of Papa Toh receiving Mama Toh through that veil with the peace and happiness they enjoy over there. No more pains and suffering with amazing new things they will discover to keep them busy which we won't know until it is time for us to join them. Meanwhile let's do our best to be busy to create a heaven on earth state in our sojourn here, expecting greater perfection only when we are there. Start with our own Heart and Mind, with our own home, our neighborhood or communities we live in, even our own country if possible. Do the best we can and I believe God will do the rest. More photos of the funeral services are found in the album here. The children felt Mom would love to hear them sing at her funeral and so a number was put together at the site of the Wake on the last day before a cortege would leave for the Crematorium. Han was away on his mission and could only express himself via email with a request to play his composed music as shared below. From the Wake near the residence, we proceeded to the Mandai Crematorium. Each of the children had a chance to speak and share their feelings about their mother before viewing the cremation procedure. The only exception is Han the oldest who had left on July 28 this year to serve a voluntary 2 year mission for our Church in Manchester, UK. I had sent an email to his Mission President saying that we wouldn't mind if he did not come home for his mother's funeral. The reasons being that he is on the Lord's errand now and that he knows he is in the right place at the right time for this moment. 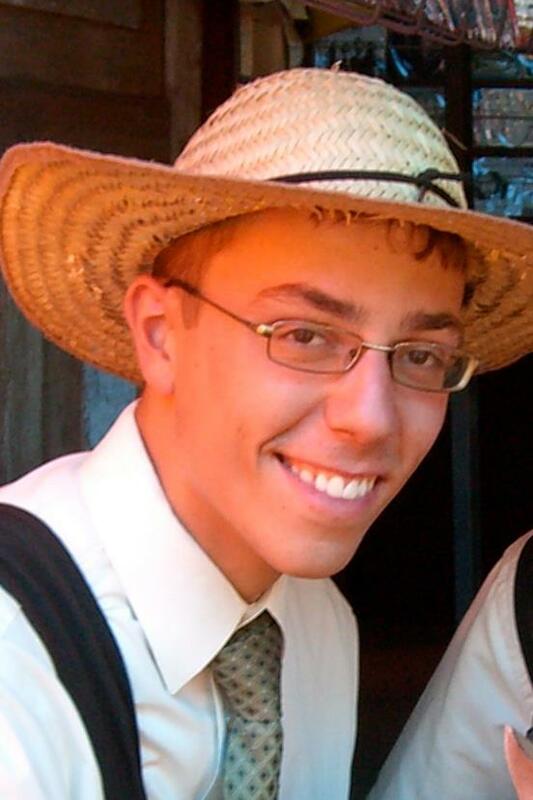 Furthermore, he had the opportunity to speak to his Mom by phone in the afternoon before she passed away arranged by his Mission President so that would suffice. A few years ago, during one of my late night chats with Mom, she expressed to me her desire for a "happy" funeral, in which we would celebrate her life more than we would mourn her death. She wanted it to be a time for us to remember all our happy memories with her. Hence, I write these words in memory of the wonderful mother Mom was for us. Mom nurtured the best in each of us. She knew what our talents were and always gave us opportunities to develop them. When I was 9, I was caught doodling in class and my teacher confiscated my drawings. Years later, Mom told me that my teacher had shown her these drawings, presumably expecting mom to punish me. However, Mom told me that all she felt was how impressed she was by my drawings. During my teenage years I spent many school nights drawing past midnight, to which Mom never raised any objections. In fact, Mom became my most trusted critic for nearly all my works. Along the way she also gave me many tips and taught me many techinques based on what she had learnt in college. Such was Mom's attitude towards each of her children's talents. She rejoiced with us when we found success, and encouraged us when we were facing difficulties. The only time Mom strongly discouraged me from embarking on a particular artistic pursuit was when I informed her that I had decided to take up A Level Music "for fun". Perhaps that wasn't a very strong reason for my decision, because Mom made repeated attempts to dissuade me from taking up A Level Music. She had heard from her close friend who has a PhD in Music that A Level Music would be a very demanding and stressful course not to be flirted with. (She couldn't have been more correct, for in hindsight, I am convinced that I left behind a good portion of my sanity in the music classroom) Nevertheless, Mom gave me the freedom to make my own decision, and I so I went ahead with it. The counsel given by Mom's friend proved true, for I quickly began to drown in the rigours of the course. However, Mom was always there to support me; she encouraged me and reminded me to stay positive. In the end, not only was I able to hone my musical skills, but I was also able to develop a stronger bond with Mom. Music always meant a lot to Mom. She recounted to me her experience as a youth who joined the church Stake Choir while she was learning about The Church of Jesus Christ of Latter-Day Saints. The Holy Ghost confirmed to her the truthfulness of the Restored Gospel as she was singing the hymn "Joseph Smith's First Prayer". Since then it became Mom's dream to sing with the Mormon Tabernacle Choir. She realised her dream just 2 years ago when she went to the States for Jiejie's wedding. What a joy it must have been for her to sing with them as a visitor! Today, Mom has left behind a legacy of music in the family, a legacy which has brought much joy to us and those around us. Most importantly, however, is the legacy of Mom's testimony of the Restored Gospel. Mom raised each of us in the knowledge of the Restored Gospel. She has taught us to always put God first, no matter the cost. Although I am thousands of miles away in the blessed land of England, I know that I am where both Mom and our Lord want me to be. The Restored Gospel has given our family an assurance that we will be reunited with Mom after this life as long as we keep the covenants we have made with God. On the other hand, there are so many people who do not have this same knowledge that families can be eternal through God's plan. Mom raised all of us knowing that each of us are children of our Heavenly Father, and it has always been her wish that each of us would be able to share with others the same message that changed life - that Jesus is the Christ and that through Him we can overcome all things, even death. I am proud to be on the Lord's errand at this time. I am inexpressibly grateful for the amazing mother He gave me on this Earth, and nothing I can do will sufficiently repay Him for this blessing. Mom lived and died with an unshakeable knowledge of her identity as His daughter, and as an earthly mother and steward of 6 of His children. She knew her responsibilities and fulfilled them well. Although her labour of love in this brief mortality has come to a close, her influence will forever live on in each of us. Cheers for a mother who gave her all for her children! Cheers for a mother who loved with all her heart, soul and mind! Cheers for a mother with whom we will one day be reunited! This is a collage made by Chelsea Grant with her own words written in memory of her dear friend Geok Lee shared in her blogpost. What is the purpose of this life we live? Is it to learn to take and also to give? And forget we were born, after a decade we’re told? To further develop over a much longer span? Could it be that this is not all? Perhaps we pass to a much greater call! Our family and friends that we love the best? Will we still know them as we do today? And if we do, will there be a right way? In a great family unit, where love doth abound. And gave Eternal Life, through resurrection to man! So we can be sealed as families both here and above. Greater meaning to life I cannot conceive. God help me prepare these blessings to receive. 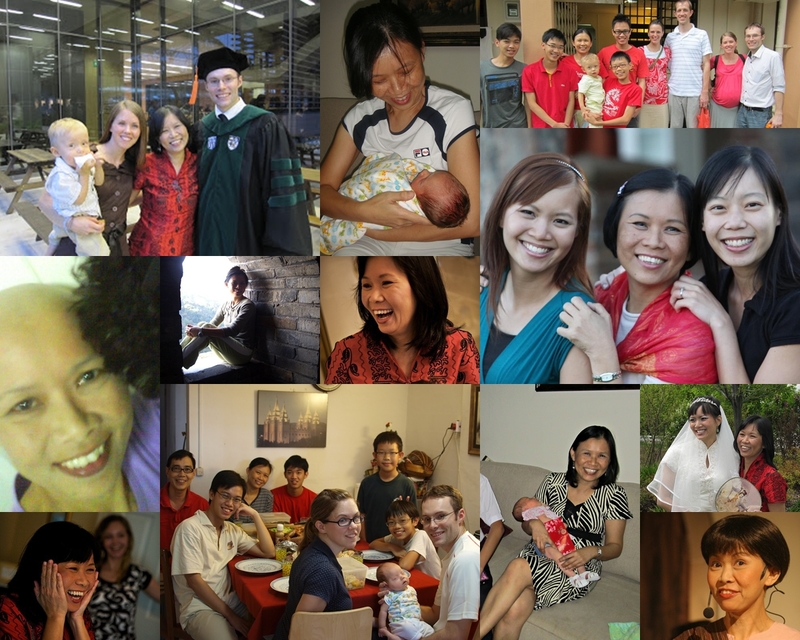 Click the following link, to continue the never ending story of the 'Unstoppable Mom' and to know how she touched our lives. The whole family managed to get together again since month's passing in a BIG familylane reunion in Singapore as recorded in the family post here. Reunions were also held as recorded in 2014 and 2016. 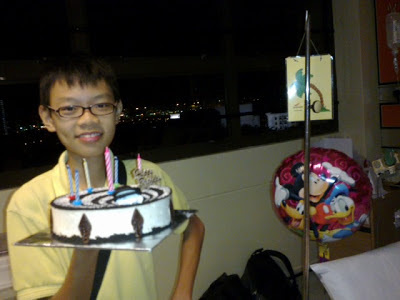 Today 2nd Nov is the 15th Birthday of Woon Ray, the youngest of our Chong family clan who has been dubbed Amazing Ray in his last birthday post. Physically he has grown but how about psychologically or emotionally? Well as a young teenager with his attachment to his puppy Ace and the sudden loss of the dog in a highway accident, his reaction and ability to write a beautiful poem for the dog's remembrance reflects his maturity to handle a crisis or loss in life. You can read the poem and watch the video at the end of the 'In Memory of Ace' post here. Full journal post of the occasion is found here. From the physical get-together at the hospital, we will return home for dinner and have Fei and Su join us online to not just celebrate Ray's birthday again without Mom but to discuss Mom's latest health condition and our family optimal plans to handle the health crisis in our family. Here are the latest pics. We did gather with Mom by her hospital as planned with the night lights of Singapore City seen in the back ground. 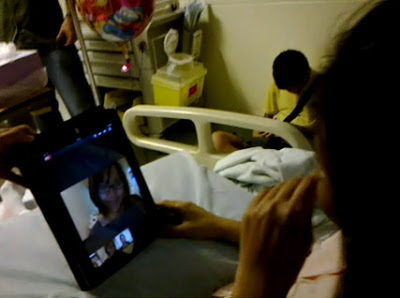 With the technology of an iPad using Google+ and the hospital's free wifi service, we found that we could connect a 3 way conference call with Su in Salt Lake City, Fei in Los Angeles to Mom right from her hospital bed without needing to return home as planned earlier! Something else to look forward to later in the month is the 20th birthday celebration of Woon Shuan on 8th Nov! His last 'landmark' 18th birthday photo is seen below. Su's husband Jay Liu celebrates his birthday a day after Shuan on Nov 9th but he is older than Shuan, being born in the year 1982 when Mom and Dad got married so Shuan wasn't even born then! The passing of Mom on 6th November and the 3 day funeral services that followed to mourn her death and celebrate her life of joy and many accomplishments had to take precedent to the birthday celebration of Shuan. Since Jay was also in town for Mom's funeral, we had a Saturday free after the funeral, on 10th Nov, to also celebrate their birthdays. The IKEA Centre in Singapore near our home seems to be a favorite place to gather for our family to find some pieces of furniture for the home as well as to have a Swedish meal. The above video shows that we must have created an IKEA family tradition to be there. The journal post covering the visit of Su and Jay earlier in the year showing our visit to IKEA can be found here. Amazingly, just as we had lit the candle and started to sing the birthday song for Shuan and Jay, the power suddenly went off! In my mind, it was like Mom testing her new powers to switch off the lights for us at the right moment for a better candle light effect! Since the power went off at home, we decided to go to the nearby Mc Donalds Japanese Garden restaurant to have our Games Night of fun and laughter. 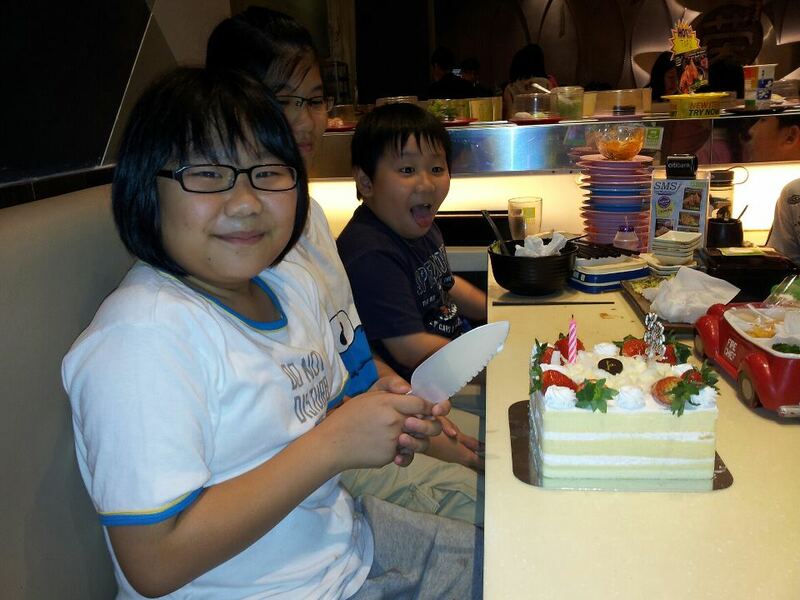 A close cousin of the children, Chong Woon Fern, the second son of Dad's fourth brother is also a November baby born on Nov 8. 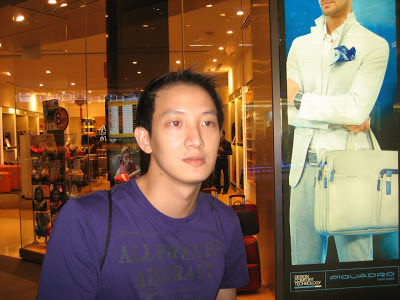 A relation close to us by marriage is Aaron Wyatt, the younger brother of Christopher, Fei's husband. He celebrates his birthday on 23rd Nov. Aaron had successfully served a mission in Paraguay from 2010-12. He left just after the marriage of Fei and Christopher and he can be seen in the background as a support to the groom to get 'Pass the Door' in this funny wedding video clip.